Before the Norman Conquest of Britain, people did not have hereditary surnames: they were known just by a personal name or nickname. After 1066 AD, the Norman barons introduced surnames into England and the practice gradually spread. Initially, the identifying names were changed or dropped at will but eventually they began to stick and to get passed on, so trades, nicknames, places of origin, and fathers' names became fixed surnames. By 1400 most English families and those of Lowland Scotland had adopted the use of hereditary surnames. Surnames deriving from a place are probably the oldest and most common. They can be derived from numerous sources - county, town or estate - or from features in the landscape - hill, wood, meadow, brook, lake. Many of these names and their derivation are obvious, others less so. The names Pickering, Bedford, Berkley and Hampshire might have been the names of estates on which the individuals worked and lived. If a person migrated elsewhere, their former place name would be a convenient way to distinguish them from others with the same first name. The origin of surnames may explain why Englishmen with a MILAM surname are of different genetic ancestories i.e. not one single genetic family but rather different genetic families perhaps once living in, or around, the village of Mileham who adopted its name. Some of these were of Germanic (Angles, Jutes, Saxon) origin, others of Scandinavian (Viking / Norman) origin and perhaps others of Roman or even Celtic origin. [623, 631] Each of those ethnic groups represent foreign invasions which displaced the early Britons to the west and north since the invasions occured by sea mostly along the east and southeast coasts. 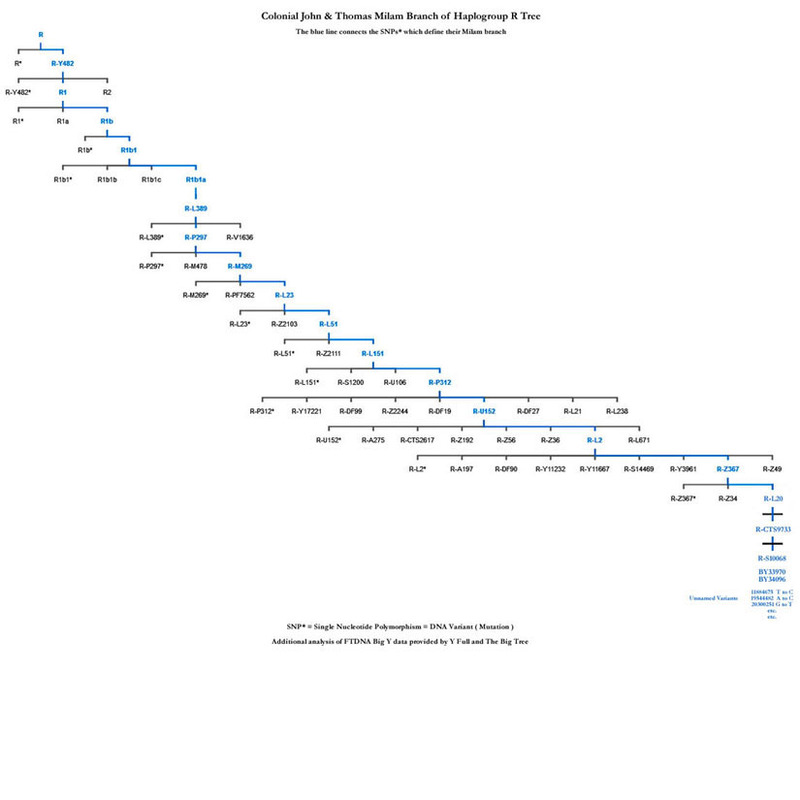 [616, 635] In early 2018 between the United Kingdom and the United States, we know of eight genetically distinct MILAM families. 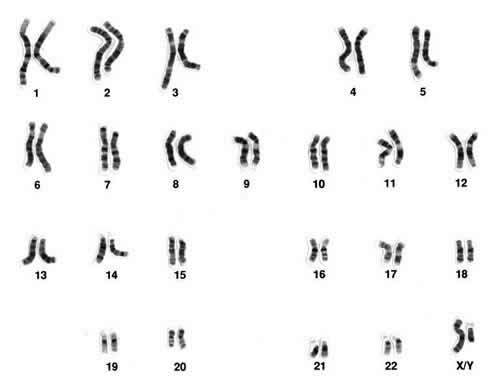 23 Pairs of Human Chromosomes Whose Pairs Exchange DNA Segments during Meiosis. Each chromosome is made up of DNA strands tightly coiled many times around proteins called histones that support its structure. 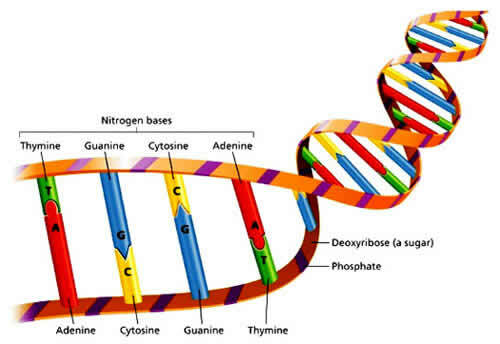 Nucleotides are the so-called "alphabet" of DNA and there are only four "letters" in the DNA alphabet which refers to their four nitrogen bases. These bases are adenine (A), thymine (T), guanine (G) and cytosine (C). A always pairs with T, while G always pairs with C. These linkages are termed base pairs. The double helix strands of DNA with the base pairs A-T and G-C linking them. Although a large portion of the Y chromosome is non-recombining and is transmited virtually unchanged from father to son occasionally mistakes in the copying process occur which are called variants or mutations. Each mutation that occurs in a new individual is inherited by all his descendants. This is why men descending from the same male ancestor share the same series of mutations inherited from all of their accumulated paternal ancestors for thousands of years (patrilineal inheritance). Men with the same set of inherited mutations can therefore be classified in the same genetic family which population geneticists call a Haplogroup (link) . Such mutations or variants are referred to as a Single Nucleotide Polymorphism (SNP - pronounced snip). More than 55,000 SNP's have been identified which can differentiate the various paternal lineages in the world. These mutations are sometimes referred to as "markers" and can be used to classify individuals into one of the 20 Y-DNA haplogroups. By testing for these variants, it is possible to trace one's genetic genealogy. The value for the marker DYS522 sequence G-A-T-A varies from 8 to 10 in these men. Genealogical STR (link) testing involves analyzing the STR segments on the Y chromosome which are referred to as Y-DNA tests. Family Tree DNA offers Y-DNA tests for 37, 67 and 111 markers named YDNA-37, YDNA-67 and YDNA-111. Below are the results for 4 men who took a hypothetical YDNA-19 test. The first marker DYS393 repeats the nucleotides A-G-A-T. All persons in this example have a value of 13 for DYS393. If we look at the second marker DYS390, one person has a value of 23 and the others have a value of 24. In this table of results, values below the mode (the most frequent result) are in a blue box; values above the mode are in a pink box. The value 23 for DYS390 is in a blue box since the mode was 24. Similarly for DYS449 at the far right, the mode was 28 and the result of 27 is in a blue box. For DYS439 the mode was 12 therefore the values of 11 are in blue boxs. STR results for 4 persons with the DYS region labled at the top of each column. STRs results can provide a prediction of an individual's haplogroup although his true haplogroup can only be confirmed by testing for that haplogroup's specific inherited mutations, SNPs, acquired over millennia by his patrilineal line. STR results also predict how closely two men are related. For example, if the results of a 37 marker YDNA-37 test are identical (genetic distance of 0), then there is a 50% probability that the two men's common ancestor lived no longer than two generations ago and a 90% probability that the ancestor lived no longer than five generations ago. If their results differ by one (genetic distance of 1), then there is a 50% probability that the two men's common ancestor lived no longer than four generations ago as shown in this table. STR tests are the oldest type of DNA test and have been used for paternity, forensic and criminal investigations for several decades. The purple colored nucleotide was replaced by a yellow nucleotide in the mutant copy of DNA. SNP (link) mutations are very stable which makes them ideal for marking the history of the human genetic tree. SNPs are named with a letter code and a number. The letters indicate the laboratory that discovered the SNP and the number indicates the order in which it was discovered. For example, BY100 is the 100th SNP documented by Big Y testing at Family Tree DNA which uses the code letters BY for its lab. As mentioned above, STR test results provide a predicted haplogroup. 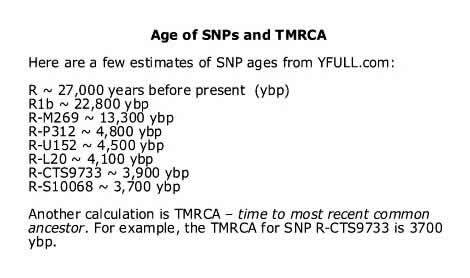 But a panel of SNP test results are required to confirm a haplogroup. SNP testing also enables researchers and enthusiasts to learn more about their deep ancestry going back thousands of years. The success of ancient DNA SNP testing of hundreds of skeletons from ancient, pre-historic cultures has revolutionized our understanding of the movement of ancient peoples into Europe and, for that matter, into North and South America as well as into Indonesia and Australia. Fourty of the fourty-two Americans thus far tested belong to the same haplogroup (link) and are all descendants of John and Thomas Milam who lived in the Piedmont region of the Colony of Virginia in the early 1700s. On short tandem repeat (STR) testing their results are always predicted haplogroup R-M269. 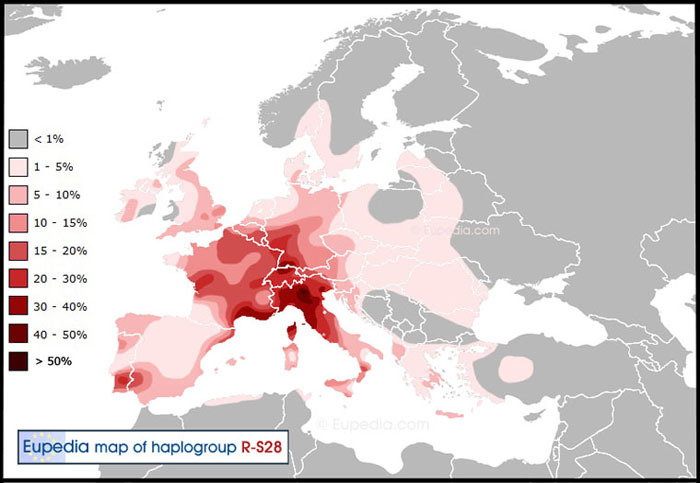 Haplogroup R (link) is one of the 20 major haplogroups of mankind; its branch R1b accounts for ~ 95% of present day west European men. M269 is a dependable ancient SNP which defines most living R1b men. On the first panel of single nucleotide polymorphism (SNP) tests ( the M269 "Backbone" SNP Pack of 137 SNP markers ), the result for these Milams is SNP Z367. When one tests the advanced SNP panel ( the Z367 SNP Pack of 122 additional markers ), their terminal SNP is CTS9733. Imagine an inverted tree with branches descending downward: each SNP panel tests markers further down the branching tree. When one tests down to the furthest known branch of the tree, it is referred to as the terminal SNP of a person's patrilineal line. The John and Thomas Milam branch can be better visualized on the tree below. Please click on the chart to see a larger version. The blue line connects the major SNP mutations which were accumulated by their Milam paternal ancestors over thousands of years which define their Milam line. Other research groups have slightly different calculated values based upon different assumptions. Four Americans from our Milam / Mileham / Milum Surname Project have taken the FTDNA BIG Y next-generation sequencing analysis. BIG Y looks at more than ten milliom nucleotide base pairs for variants or mutations, most commonly referred to in genetic genealogy as single nucleotide polymorphisms or simply SNPs. These four descendants have more than 2000 identical variants (SNPs) representing the accumulated mutations of their Y chromosome passed down to them by all their paternal ancestors. Descendants of Thomas Milam (1716 - 1775) are on the left and of John Milam Sr (1718 - 1789) on the right. When our first BIG Y results were reported nearly three years ago, our Terminal SNP was CTS9733 and we each had 35 Unnamed Variants. Thanks to the thousands of men who have tested since, most of those Unnamed Variants have been given official SNP names. Most SNPs are named by more than one testing laboratory so often a SNP is represented by two alphanumeric symbols side by side as above. As of 2018, our testees no longer have the Terminal SNP CTS9733. John Milam Sr's descendants now have the Terminal SNP: R-BY67643 . Thomas Milam's descendants now have the Terminal SNP: R-BY34096 . These results will be updated from time to time by FTDNA as more men complete the Big Y analysis and as more Unnamed Variants become named SNPs. As of November 2018, it appears that the FTDNA BIG Y analysis can distinguish between the descendants of the two Milam Virginia Patriarchs, John Milam Sr. and Thomas Milam. The interesting question is when did this genetic divergence occur? Three of these men have agreed to upload their YDNA data to Y Full.com for further analysis. Other Milam / Mileham / Milum families lie on other branches of haplogroup R and also on branches of the haplogroups E, I and J. In 2018 between the United Kingdom and the United States, we know of eight genetically distinct MILAM families. I will now discuss what we have learned from the Y DNA testing of 26 British men. The men were initially tested with the YDNA-37 Short Tandem Repeat (STR) test which showed that most men fell into two large haplogroups: I1-M253 and R1b-M269. As the number of results grew, it was appropriate to selectively test some members further with Single Nucleotide Polymorphism (SNP) panels of 120+ SNPs. A few of these men were tested with a second more advanced SNP panel. In 2019 we know that there are at least six genetically distinct MILAM families in Great Britain as may be seen by their YDNA results at our FTDNA webpage, here (link) . More than half of them (15) belong to our Great Britain-1 subgroup, haplogroup I1-M253>F2642, which among present day Europeans has a “Nordic” distribution. Their oldest known ancestors were from eight different counties stretching from Lanarkshire in Scotland to Devon and Kent in the south. But they are concentrated in and around Berkshire (3), Hampshire (4) and Surrey (3). These are the men who are the same haplogroup as American Kit # 120119: I-M253>F2642 . This American's oldest known ancestor was William Mileham born ~ 1756 in the Colony of Pennsylvania. 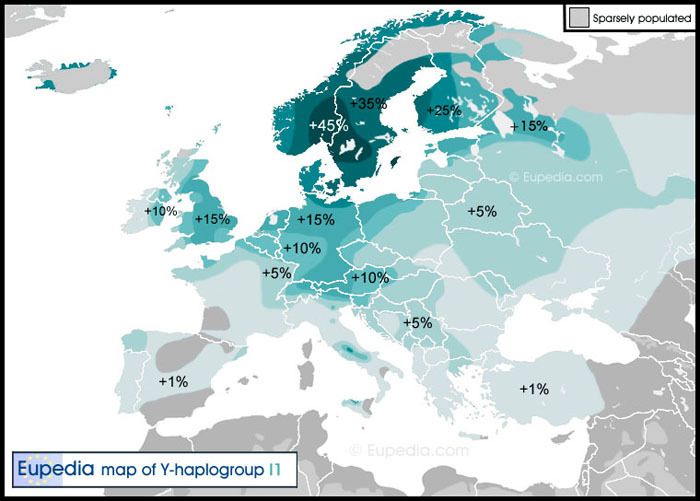 Present day distribution of Haplogroup I1 is concentrated in Sweden and Norway and radiates out from there. 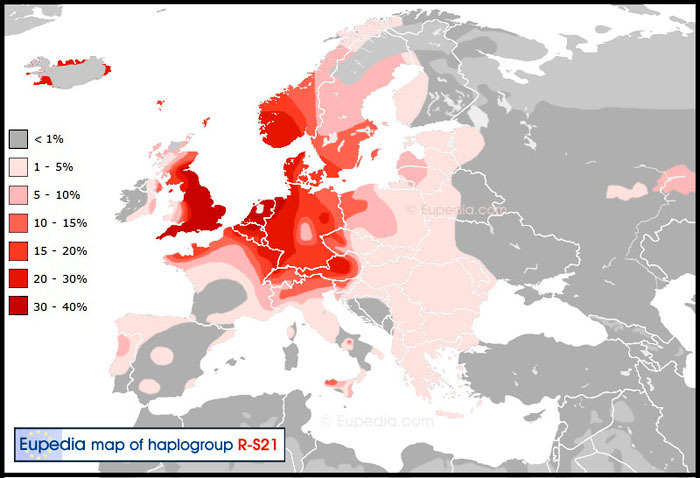 Five men belong to our Great Britain-2 subgroup, haplogroup R1b-U106>Z326, which among present day Europeans has a distinctly “Germanic” distribution. Their oldest known ancestors were from Norfolk, Suffolk and Cambridgeshire not far from the village of Mileham with its Anglo-Saxon name and Norman ruins - a metaphor for the MILAM mix of ancestry. Our Great Britain-3 and Great Britain-4 subgroups belong to other branches of the R1b>U106 (S21) tree i.e. R1b-U106>L48 and R1b-U106>Z18 respectively and share the same “Germanic” distribution as seen on the map below. SNP U106 is also known as S21. Present day distribution of Haplogroup R-U106 (S21) is concentrated where Germanic languages are spoken. 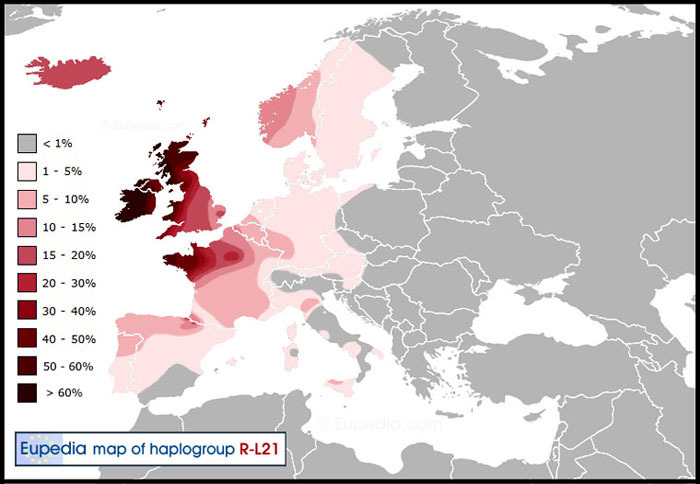 Present day distribution of Haplogroup R-L21 is concentrated in Celtic speaking regions. Present day distribution of Haplogroup J-M172 (J2) is concentrated in the Middle East and Mediterranian. Alas, none of our 26 British men has the haplogroup of most American MILAMs, R1b-U152 (also known as S28), which ancient DNA studies suggest mostly arrived in England with the Iron Age Celts (~ 800 BC ). [626, 627, 633] Their highest representation in present day England (10 - 15%) is in the Norfolk / Suffolk region, around London and in the southeastern County of Kent as shown on the map below. Just across the English Channel is the village of Millam in the Nord-Pas de Calais region of France south of Dunkirk. Because our haplogroup R1b-U152 is fairly high (15 to 20% of the population) in Flanders as it is in Kent, there is a possibility that this is the origin of our ancestors. Unfortunately we were able to test only one Englishman whose ancestor was from Kent. See the map below. Present day distribution of Haplogroup R-U152 (S28) is concentrated in the mountain / lake districts of the Alps. SPECULATION: After these negative results for finding a Y-DNA genetic match, we must consider the possibility that John and Thomas Milam of colonial Virginia were orphans taken in by a Milam family, perhaps their mother's family. It was not uncommon in the early 18th century, when the English economy was in a depression and jobs were difficult to find, that orphans viewed life in America as an indentured servant (link) to be their best option. This might also explain why the earliest records for John Sr in Brunswick County and Thomas in Orange / Culpeper County place them ~ 165 miles apart: their indentures (contracts) might have been sold to different "masters" when they arrived in Virginia. You may read the evidence for why they were indentured servants here (link) . Nota Bene Genealogists: if two men have identical results on their YDNA-37 marker test, they have a 90% probability of sharing a common ancestor within five generations. I count fifteen of our British members who share identical YDNA-37 results with another member and thus may be related. My colleague, James Richard Milam, is continuing our search by joining several county family history societies in Great Britain. Rick has written an article about our Project for their newsletters. The quest goes on.